You may have heard of the term "job crafting." You may even have done it without realizing. Job crafting is a technique used by employees to redesign their own specific roles to foster greater job satisfaction. It's a mind trick that turns a bad job into a tolerable one, or a good job into a great job. The techniques employed in job crafting can also be used in an interview situation, putting you in the driver's seat and making you a star interviewee. 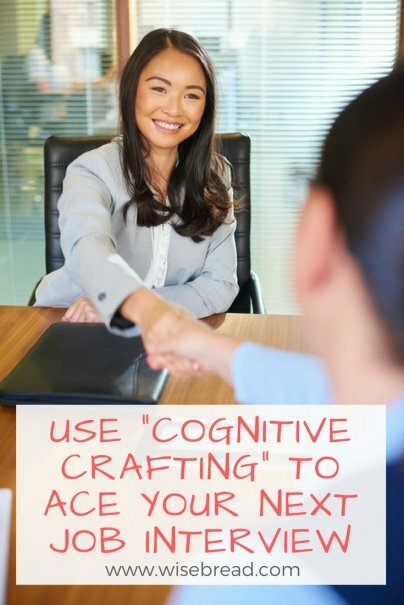 It's called cognitive crafting and it can work wonders. The simplest way to describe it is a paradigm shift; you are looking at the exact same information or scenario, but in a different way. One example of this is the infamous rabbit and duck illusion, described by philosopher Ludwig Wittgenstein as "seeing that" versus "seeing as." You may look at the image and see a rabbit. You may see a duck. The shift happens when you go from one to the other, opening your eyes to a new view without anything changing other than your own opinion. Another example of this comes from a story about a man on a train, sitting solemnly as his two children cause havoc. They're jumping on the seats, running around, shouting, and he is doing nothing. A bystander says, "What a terrible parent, he should do something about his kids." Then, someone tells the bystander, "I was just with him at his wife's funeral." Suddenly, the bystander has a complete shift in perspective. Nothing has changed. The kids are still running around, the man is still sitting in silence, but now the feeling felt is one of empathy, not anger. Perhaps the simplest piece of cognitive crafting you can use is to turn the tables on the whole situation. As soon as you are asked to go in for an interview, start telling yourself that you will be interviewing the company to see if they are a good fit for you. In fact, go one step further, and tell yourself that they have to prove they're good enough to have you as an employee. Give yourself a genuine self-appraisal before your interview, and use performance appraisal language while you do so. If you're unfamiliar with this type of phrasing, you can look up hundreds of examples online. The goal is to find different ways to talk about yourself and your achievements without sounding repetitive or dull. You're not just there to fill a vacant role. You're coming in as a trouble shooter; someone that will see the problems, know the solutions, and have ideas that will make the company grow and prosper. It doesn't matter if the company is as successful as Amazon, or one that's known to be in trouble. You are there to take things to the next level. Do your homework, look at potential weaknesses that can be fixed, or find ways to boost impact and revenue. Take these ideas with you, and offer them up enthusiastically. If you're seen to already be actively interested in the success of the company, you will be seen as a much more valuable asset. This may actually be true, but whether you're first through the door or last in line, assume the hiring manager has been doing this for nine hours straight with very few breaks. They're tired. They're cranky. They're smiling through gritted teeth. They have heard everyone answer the same questions the same way. They've heard people recite long passages from their resumes when they asked them, "Tell me your strengths and weaknesses." When politicians are being interviewed, they know exactly what they want to talk about, even if the interviewer is asking different questions. At its worst, it's obstructionist and annoying, usually because the politician refuses to answer the actual question. You don't want to do that. Answer the question the best way you can. It's a cognitive crafting technique that almost everyone knows about, and it's supposed to help you shake your jitters and feel superior. It doesn't work. At best, it distracts you from thinking about something that really matters. More often than not, you could start smirking or even stumble over your words in an attempt to cover your mind game. Instead, if you're having confidence issues, there are a number of exercises you can do beforehand to put yourself at ease. First, record yourself being interviewed by a friend or relative, and play it back. Listen to the number of times you repeat a phrase or say, "Umm." Then, do it again, and again, until you are happy with the result. Practice like this is invaluable. Study some body language techniques that make you feel bigger and more confident. And study the company and the position thoroughly so that you feel sure you can answer any question.